Penny for the Irish Guy? A Forgotten British Tradition. Guy Fawkes Night (which might also be called Guy Fawkes Day, Bonfire Night or Fireworks Night) is a commemorative event taking place on November 5th. It is first and foremost a British event and has been almost forgotten (or replaced) by other festivities around the same time. The celebration commemorates the day a few Catholics tried to wipe out the ruling British (Protestant) establishment … and failed. Thus, in Ireland, Guy Fawkes Night used to be observed as a day of joyous celebration by only a part of the population – and these days only some Loyalist communities in Northern Ireland may actually host events on the day. Guy Fawkes Night had its origins in a failed assassination attempt - on November 5th in the year of 1605, Guy (or Guido) Fawkes was arrested in cellars beneath the House of Lords. Not only was he trespassing, he was also caught red-handed ... guarding a massive stash of gunpowder in barrels. These were placed under the parliament building to cause bloody havoc amongst the Protestant ascendency and kill King James I. The (albeit far-fetched) aim of the so-called "Gunpowder Plot" was the re-establishment of a Catholic monarchy in England and Scotland, and the reversal of the reformation. Whether this would have been successful, even had the plot succeeded, is open to discussion. It is more than likely that there would have been a short period of chaos and anarchy, followed by an establishment crack-down on the perpetrators of the plot. which in defeat made a spectacular volte face and joined the Spanish), he tried to enlist Spanish help for an English re-establishment of Catholic rule. This was not too successful, but Fawkes cultivated friends in high places ... which led him to become involved in the Gunpowder Plot. After his arrest, Fawkes was interrogated and (perhaps in a fugue of self-glorification) freely admitted to planning the massacre. Basically inviting a swift execution. This, however, did not quite work out as planned - he was only later tortured, in an attempt to get him to give up the names of co-conspirators. Pleading "not guilty" at the subsequent trial for treason (in his own eyes, Fawkes had done no wrong after all), he was (to no great surprise, and much public acclaim) found guilty and condemned to a prolonged death. Kept as the "star attraction" of the public hanging, drawing and quartering on January 31st, 1606, Fawkes witnessed the gruesome deaths of his fellow conspirators. And then, in a final and inspired display of defiance, managed to cheat the hangman by throwing himself off the high scaffold and breaking his own neck. By the way ... there is a theory that the conspiracy was in reality a false flag operation and that Guy Fawkes was framed. In celebration of the fact that King James I had survived this nefarious attempt on his life (as the official propaganda spun it - Guy Fawkes was arrested around midnight and the primitive IED was actually made safe several hours before James I even arrived for the Opening of Parliament scheduled for November 5th), spontaneous bonfires were lit around London. A short while later an "Observance of 5th November Act" was passed, making the day an annual celebration of thanksgiving. Faced with religious and dynastic insecurity for the next few decades, the British public took to "Gunpowder Treason Day" like a duck to water. Labelled as a day of celebration, thanksgiving and some fun, it soon acquired strong religious overtones. As a focus for anti-Catholic sentiment, the annual celebrations worked a treat. Especially Puritan ministers delivered fiery sermons on the dangers of "popery" (often exaggerated beyond all reality, but apparently not beyond all belief), whipping their flocks into sectarian frenzy. Which carried on outside the church - unruly crowds not only lit celebratory bonfires, but also used these to burn the pope or Guy Fawkes in effigy (the effigies were sometimes stuffed with life cats for better sound effects). Around the time of the Regency (1811 to 1820) it had become common in some areas for children to prepare an effigy of Guy Fawkes well before the event, take it to the streets and using it as a prop for begging - hence "A penny for the guy?" It had also become quite common for old scores to be settled on Bonfire Night, with rioting and fights not unknown. In the middle of the 19th century attitudes changed markedly and the Observance of 5th November Act was repealed in 1859, the anti-Catholic extremists and rioters being dealt with and the celebration transformed into a family-friendly event at the turn of the century. During the 20th century it was still observed, but today it has almost been eclipsed by the transatlantic import of Halloween. The Gunpowder Plot mainly targeted England and Scotland - both Wales and Ireland were mere side shows to the goings-on there, and especially Ireland was busy pursuing her own agenda most of the time. But British settlers carried the Guy Fawkes Night tradition everywhere, notably to the American colonies and into Ireland, especially the Plantations in the North. In North America it became known as "Pope Day" and was losing popularity in the 18th century (after all the revolutionary fervor did somehow clash with celebrating a British king's survival). In Ireland it was mainly, almost exclusively, observed in the Protestant communities and soon became another bone of sectarian contention. These days, Guy Fawkes Night is almost totally forgotten, even in Northern Ireland - where many revelers will be exhausted by the Halloween season anyway (the theories that Guy Fawkes Night was a conscious Protestant replacement for Samhain are not very convincing). 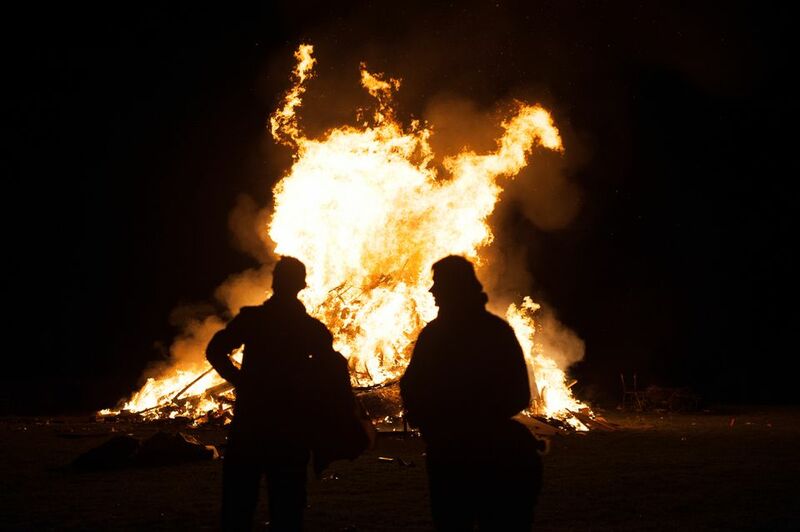 Ireland retains two major "Bonfire Nights" to this day - one is on the eve of the 12th of July (anniversary of the Battle of the Boyne, hence only celebrated in Loyalist communities). This has many similarities to Guy Fawkes Night in that a vitriolic anti-Catholicism is celebrated and that the pope may be burned in effigy (alongside politicians like Gerry Adams). The other "Bonfire Night" is mainly celebrated in Catholic areas on St. John's Eve (June 23rd). In recent years, bonfires have also been assembled and lit on Halloween. Most of these bonfires tend to be a health and safety hazard, so local councils are striving to prevent them being lit. Which, in turn, makes them a bone of contention due to festivities being interrupted by the arrival of the fire brigade, and frequently the focus of unsocial behavior. Paying for Things in Ireland: Cash or Plastic?